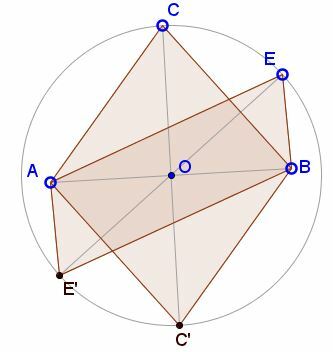 The parallelogram with maximum perimeter for given diagonals is a rhombus. But this follows from the AM-QM inequality. 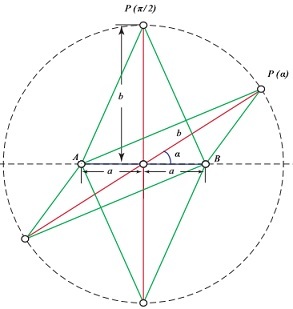 Since the foci of an ellipse lie on its major axis, the circle $(O)\;$ has as its diameter the minor axis of the ellipse and is therefore located within the ellipse. 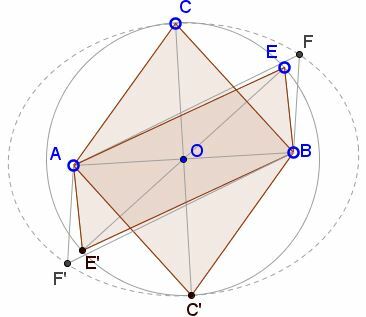 If $F\;$ and $F'\;$ are the points of intersection of the diagonal $EE'$ of the parallelogram $AE'BE\;$ with $\epsilon\;$ then $AC+BC=AF+BF\ge AE+BE.\;$ This is because the perimeter of a convex polygon lying within another polygon does not exceed the perimeter of the latter.